Newbuildings Stephen Wallace acknowledges the applause after securing his century in their win over Killyclooney. It was a fairly quiet weekend on the North West cricket front with just three senior matches in the Long’s SuperValu Championship to keep the local fraternity entertained. 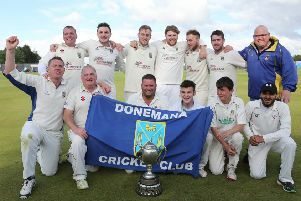 Top-flight teams had been given the weekend off as most clubs were impacted to some degree by the Interprovincial T20 tournament at Pembroke which would ultimately see the trophy stay yet again in Leinster. The Dublin-based outfit have a remarkable record across all three formats in this competition and they were given a real boost at the start of finals weekend as the North West Warriors, their closest pursuers, went down to a surprise opening defeat against Munster Reds. Having won their first two matches in the T20 Cup earlier in the season this was a disappointing result for Ian McGregor’s charges, who, to be fair, have been excellent up until now. Strabane’s Aaron Gillespie seemed to have given the Warriors a decent chance of winning their opener as he made 80 in a score of 162, but the Reds chased it down to win readily. Saturday saw another defeat, this time to the reigning champions, as a terrific partnership between John Anderson (76*) and George Dockrell (40*) set Lightning on their way to a huge 182-3 from their 20 overs. David Rankin (36) and Gillespie again (34) battled hard but Andy McBrine’s men couldn’t get close enough. The North West lads’ disappointing weekend ended with a third successive reverse - Rankin among the runs again here- but even an impressive 67 from the Bready man couldn’t prevent the Northern Knights from recording their first win of the season over the Warriors. 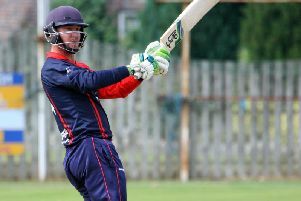 The Belfast-based side posted a daunting 193-6 in their 20 overs with Greg Thompson making 80 and Shane Getkate 41 and although the Warriors started brightly with 50 in the first 6 overs from Rankin and William Porterfield (22), they couldn’t retain their momentum and only managed 144-5 in reply. Domestically, the three Championship matches that did go ahead on Saturday (Ballyspallen v St Johnston was postponed owing to a bereavement) saw Glendermott stretch their lead at the top as teams started the second half of their respective programmes. Gordon Montgomery’s century got them off to a great start at Bonds Glen and the visitors never looked like losing the momentum after that. A superb spell of bowling from Dale Culbert (6-5) got the job done easily for the leaders. Killyclooney missed the chance to keep pace at the top as Stephen Wallace’s superb century saw Newbuildings record a much-needed win at home to Darren Moan’s team. It has been a really inconsistent effort from Marty Mehaffey’s side this year - a semi-final place in the senior cup and a final spot in the Eric Cooke competition unable to disguise five losses in their first seven league matches. Burndennett too are hanging on to the leaders’ tails after a couple of seasons in the doldrums - Eddie McGettigan’s team showing their “Jekyll side” at the weekend with a strong batting performance down at Drummond. These are troubled times for the Roe Valley men who now sit bottom of the second-tier having been a Premiership side this time last year.